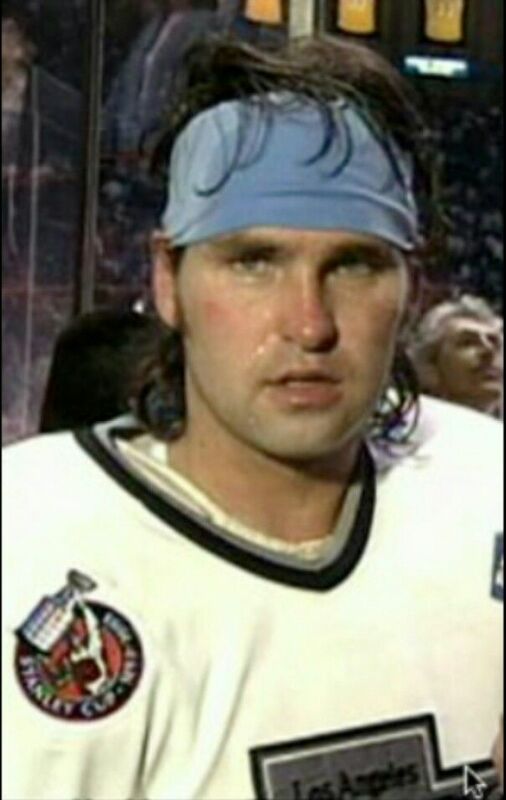 I’d like to talk about Kelly Hrudey, if I may. I’ve worked with Kelly a few times. We’ve hosted television a couple of times, we’ve done events, and we did a shoot together recently where he showed me once more what kind of guy he is. He was an NHL Goalie. He played with a few teams, including the New York Islanders, the San Jose Sharks, but most of us know him as this guy with the Los Angeles Kings. I know. No one rocked the headband like Kelly Hrudey. Since his retirement, he’s become an NHL commentator on Hockey Night In Canada, one of the most iconic brands in the country. Hrudey’s analysis of hockey games has proven invaluable for CBC, his piece on how the glove can also be a blocker won a 2006 award at the Canadian Music and Broadcast Industry Awards. He does not unbutton his jacket when sitting down as is the usual style advice for men. If there’s one thing Wikipedia does well, it’s clear information, well organized into focused topical paragraphs. I like to ride my bike. And I just finished another project that I think says everything you need to know about Kelly Hrudey. On DKL5 we had this idea for a video that was, well, let’s face it, a bit stupid. But it made us laugh when we were talking about it, so we decided to try it out. There is a web series that Jerry Seinfeld does called, “Comedians in Cars Getting Coffee.” It’s a tremendous series where Jerry takes out a different comedian in a vintage car for a drive and then a coffee. While seated in some amazing car and cool coffee shop, they talk about cars, life, comedy, careers, whatever. It’s great. Our idea was instead of Comedians in Cars Getting Coffee, what if we did Canadians In Cars Getting Coffee. Instead of Comedians, it would just be Canadians, and instead of fancy cars and cool coffee shops, we’d just sit in my Jetta with a cup of Tims and see what happens. So I called Kelly, asked if he’d be up for this dumb idea we had. He laughed and said “explain that to me again?” I did, he laughed again, and said sure. So we found a place close to the Saddledome (you can see the Elbow River right behind the shot of the Jetta), set up the cameras, and waited. He pulled up, got out of his car, got into my car, did the shoot, and 15 minutes later he was gone. It was awesome. The script was simple. We’d start to roll, he’d wait a bit, then turn and ask me, “Is this a Jetta?” I’d take forever to say “yeah.” And that would be it. Dumb, but perfect. The second clip is a line that made us laugh and Kelly just nailed. Which isn’t easy to do when you have no idea what is going to come out of my mouth. But here’s the thing you don’t see in the video. When he first arrived, he got out of his car, looked around, saw me, and then immediately went to Matt, one of our crew, and introduced himself. “Hi, I’m Kelly.” Same thing with Mike. And everyone else on the crew. That’s not something most famous people do when they come to get interviewed. Then he came over to me, we said hi, and got to work. He wasn’t trying to be some fake humble guy. He was doing me a favour to do the shoot. He was taking time out of his day. And he took the time to introduce himself to everyone. Jann Arden told the story on DKL5 about Rod Stewart and how this rock icon walked into the TV studio they were in and introduced himself to the camera people, the floor directors and the rest of the crew. Jann talked about how impressive it is for someone who might be lucky enough to be famous, and because of that fame have the opportunity to be led around by their ego or be a diva. But the great ones don’t. Because Kelly Hrudey already showed me.